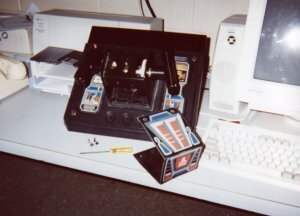 The following write-up explains how to convert a control panel from an Atari Return of the Jedi machine so it works on a standard PC gameport. If you would rather build a USB yoke, there is an alternative hack available—see the FAQ at the end of this document for details. "I already tried, it's magnetically sealed!" Before starting work on the flight yoke conversion, you need to gain access to the inner workings of the controller. This means you have to take off the front face plate (the part that says Atari on it). This plate is held in place with 4 pesky security type Allen head screws. The ones on my controller were 3/32 inch hex, which means you need a 3/32 inch ball driver or Allen wrench to get them off. If you can find a set of the security Allen wrenches, more power to you. I received only strange looks at the local hardware stores, so I had to take more drastic measures. If you find yourself in the same situation, you'll have to drill the little posts out of the bolts before unscrewing them. Use a power drill for this (or a milling machine if you have access to one). Be careful while drilling, or you'll wear down the edges and won't be able to get the screws out. (I ended up replacing my screws with standard machine screws--if you want to do the same thing, buy screws with a 6 - 32 thread.) Once you have the screws off, you're ready to swap in some components. "Sir, if any of my circuits or gears will help I'll gladly donate them!" My hat goes off to those fine folks at Atari for building such a modular controller. What you need to do now is remove the original potentiometers (pots) from the controller. 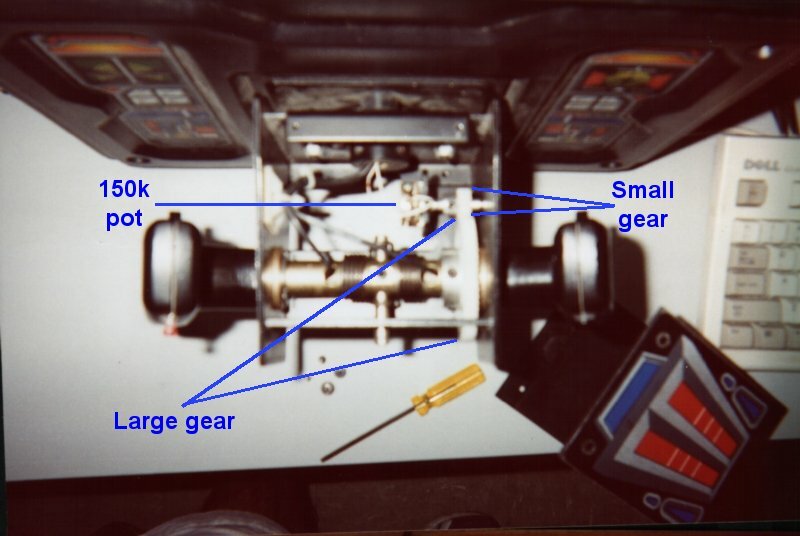 It turns out that the potentiometers that Atari used were of the 5 k Ohm variety, while modern PC joystick ports require pots in the realm of 100 to 150 k Ohm. Fortunately, the original potentiometers were of the standard style, and replacements that fit are easily found. Use linear, not audio taper pots! 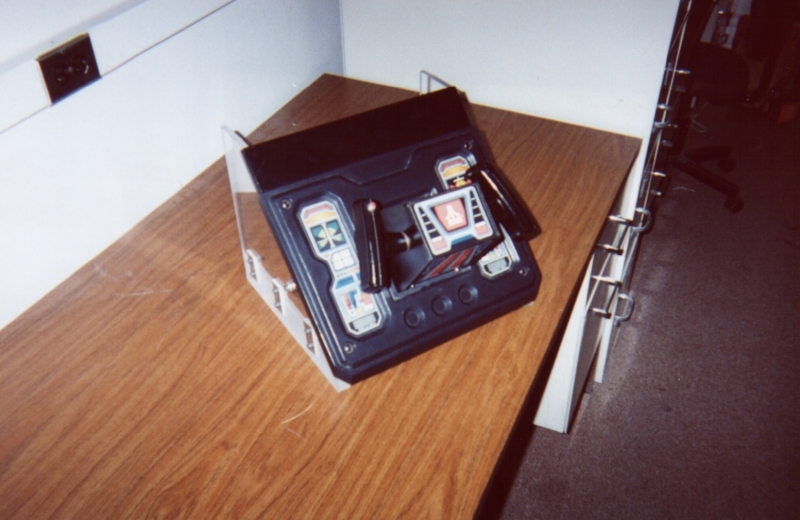 There are two pots in the controller, one that drives the vertical axis (inside the front panel you removed in Episode 1) and one that drives the horizontal axis (on the back side of the control panel). The first thing you'll want to do is remove the plastic gears that are attached to the potentiometers. This job requires a 7/64 inch ball driver (or Allen wrench). Loosen the bolt, and slide the gear off the shaft. Now you need to remove the potentiometers from the mounts in the panel. You'll need to use an adjustable wrench to take out the potentiometers--they are held in place by nuts that are coaxial with the shaft. You can now clip the wires (3 per pot) and remove the pots. Save the pots in case you ever want to convert the controller back to its original state or go the USB hack route (see the FAQ below). 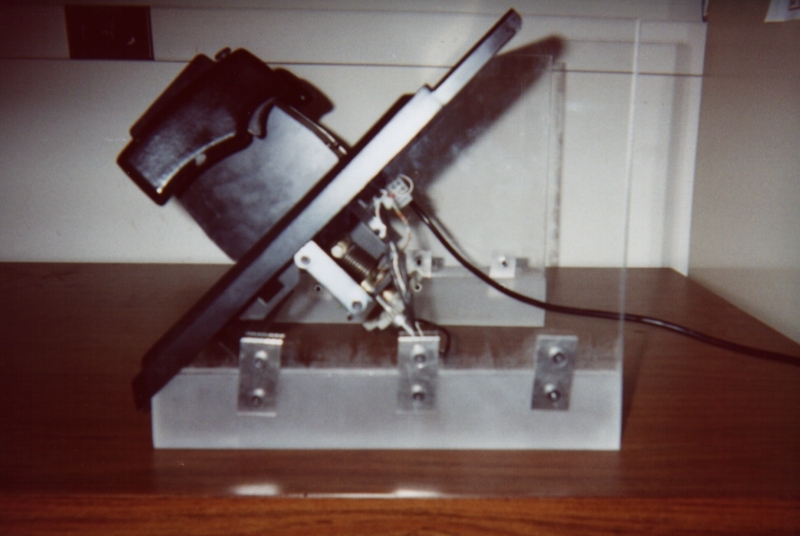 The big plastic gear drives the smaller gear above it, which is attached to a 3/4" turn , 100k Ohm potentiometer (Y axis). Now it's time to put those new pots in the controller. For the one going inside the front panel, you'll probably have to cut the shaft so the thing will fit inside (if you're using the same pots I bought). Just put the shaft end in a vice and cut it to length with a hacksaw or dremel tool. After cutting the shaft, place the pot in the same position as the original pot. Replace the nuts and washers to insure a snug fit. Do the same for the X axis pot. What you need to do now is make sure the pots are centered. If you have access to a multi meter, set it to measure resistance (Ohms) and dial each of your potentiometers until the meter reads 50 K Ohms. Once the potentiometers are centered, replace the gears, insuring that the teeth of the small gears are interlocked with the teeth of the big gears. Now, without turning the shafts of the potentiometers, tighten up the bolts on the shafts attached to each of the small plastic gears. Once you have tightened the gears, check the resistance of the potentiometers. They should read roughly 50 K Ohms while the mechanical axis in question is at its spring-centered point. If you’re not reading 50 K Ohms, loosen the gear in question and repeat the procedure outlined above until 50 K Ohms is reached. Make sure each axis is set so the controller is limiting the range of motion (by those heavy metal stops and posts) on the far left/far right (or far up/far down) positions. If the pot the limiting factor in the motion, you won't be getting full motion onscreen during game play (and you might break the pot if you torque the controller too hard!). You may need to revisit this process later for fine adjustment. Now that everything is in place, it's time to do some wiring and soldering! "This one goes there, that one goes there!" Now that all the hardware has been swapped, it's time to wire the controller up to the joystick port. It would be a good idea to get a hold of a multi meter to test the pots. You only need two wires coming from each pot (rather than the 3 that the Atari protocol uses). Solder one wire to the middle pin on each pot, and one wire to each leftmost pin. (The word 'leftmost' doesn't matter much here, since you can reverse joystick axes in most emulators.) To test a pot, connect a multi meter to the two wires and turn the pot. You should get a resistance range that goes from 0 to 100 K Ohm (if you bought a standard 3/4 turn 100 K pot). Send the wires for the vertical axis through the yoke (where the factory wires are going). If you want, you can use the original wires for this purpose--you'll just have to find them on the insulated connector coming out the back. I opted to use my own new wires. When you're done with this step, you should have 4 wires coming from the pots. Now it's time to get some wires set up for the fire buttons. If you want, you can use the factory wiring, and avoid opening up the handgrips entirely. To do this, you’ll have to press the buttons and search for connections with a multi meter. (On a Jedi controller, the triggers are white wires, the push buttons are red wires, and they all share a common ground, which goes to some black wires.) For direct tracing of the wiring, you can gain access to the buttons by using a 7/64 inch ball driver to open up the handgrips. After removing the two screws (thankfully they aren't the security type!) simply remove the handgrip shells. Be careful not to loose the little springs connected to the triggers/buttons--they have been planning an escape for a long time! The switches utilized for the fire buttons are the small microswitch type. In each grip you will find that the trigger (white wire) and push-button (red wire) share a common ground (black wire). Again, use the multimeter to figure out where the switch wires end up on the other side of the yoke--I opted to use the factory wires for my firing buttons, but again, you can wire your own if you want to. If any of your buttons, springs, or switches are mangled, they can be replaced. 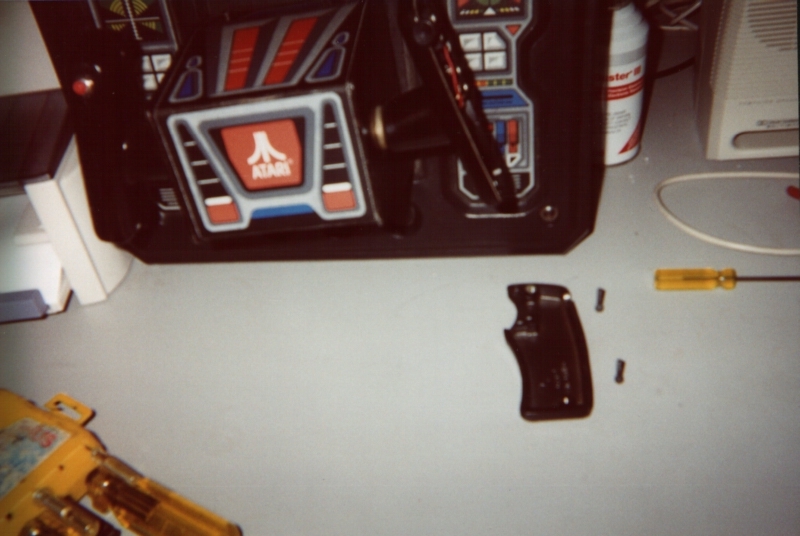 There are often people selling replacement parts for Atari yokes on Ebay or in the arcade newsgroups on Dejanews. I recommend purchasing a 6 foot joystick extension cable. An extension cable is a good way to go because it contains a discrete wire for each pin (15 of them) on the joystick port. This will enable you to run up to 4 discrete buttons on your yoke. (you need 3 discrete buttons for Return of the Jedi!) These extensions run around $14 or so and can be picked up at most computer stores. Remove the female end of the cable with a pair of wire cutters (leaving the male end to plug into your game port) . Using a razor blade or utility knife, carefully slice open the cut end of the cable to expose the wires within. There should be 15 wires, and if you're lucky, the manufacturer used different colors for each of them. A wire stripping tool is a must have in this situation. Now you need to figure out where to connect all of these little wires. There are some excellent resources on the web describing the functionality of the game port. Ok, keep in mind that some game cards use the pins a little differently (in case things are really going awry!). This pinout hasn't done me wrong yet though. See the site I referenced above for more details, or some of the excellent resources on John St.Clair's controller site. For this project, pins 1,2,3,4,6,7 and 10 will be used. This gives us X,Y control and three buttons. (You can wire up the fourth button if you want to.) Now it's time to connect the yoke wires to the joystick extension wires. I suggest a temporary setup first to troubleshoot things, followed by a permanent connection when things are 100% working. Connect the two white joystick trigger wires (traced to the molded connector with a multimeter) to pin 2 (Switch 1). Connect one red joystick button wire to pin 7 (Switch 2), and the other to pin 10 (Switch 3). Connect the two black joystick ground wires to pin 4. On my controller, it was ok for all of the switches (1-3) to share the same ground. Connect one wire from the X pot to pin 3 (X1). Connect the other wire from the X pot to pin 1 (+5 V). Connect one wire from the Y pot to pin 6 (Y1). Connect the other wire from the Y pot to pin 1 (+5 V). If you want to, you can use the +5V source at pin 9 for either X or Y control if it makes for more convenient wiring. I ended up using a couple of 12 pin molded nylon connectors (from Radio Shack) to make the connections. You can make tidy connections with this connector, and reuse that joystick extension cable for other projects. Now you're ready to plug the controller into your computer and test it out! Make sure you don't have any dangling exposed wires coming from the joystick port--if the +5 V wires ground out, they can generate a lot of heat! "No more training do you require.. already know you, that what you need.."
Now that you have finished the wiring, you still need to mount the control panel to something. If you have an old neglected cabinet handy, go for it! If not, you can fashion a case for the controller yourself. I ended up making a desktop case out of plexiglass. The plastic piece on the front of the control panel easily unbolts, giving you access to the bare sheet metal below. 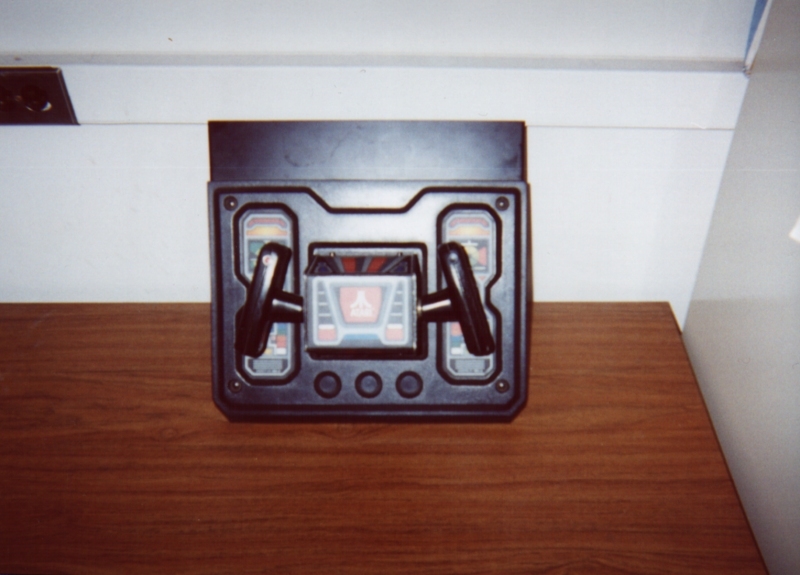 This allows you to mount the control panel in any fashion you see fit. I could go into some more details about the case I built, but I'll leave that story for another day! If you have any comments, questions, or suggestions, feel free to contact me via email. Frequently Asked Questions: Where can I get a Star Wars yoke controller? 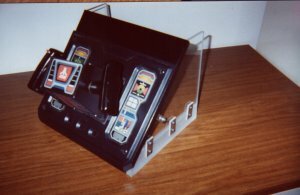 Where can I get a Star Wars yoke controller? This is by far the most frequent question I have received over the years. The short answer is Ebay--that’s where I found mine. Also, you might want to snoop around the arcade newsgroups on Dejanews---they are always selling arcade parts. You should keep in mind that there are a few other less well known games produced by Atari that used yoke controllers. S.T.U.N. 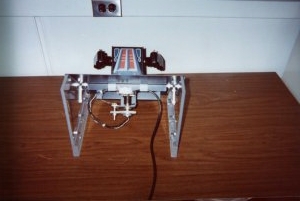 Runner and Hydra both use the same style yokes found on the Star Wars machines. When looking for yokes on Ebay, you might want to consider a broken yoke, or one that is missing its wiring. These go for a lot less that pristine yokes, and you’ll have about the same amount of work to do either way! How much do yokes cost? Well, I have seen them go for as little as $25 for a dinged up yoke, all the way up to $150+ for a beautiful looking yoke NOS yoke. I think $100 is pretty typical these days. Sometimes I have to recalibrate my yoke when going from one game in MAME to another.. why is this? Well, I think it has to do with the way some games are emulated in MAME. This may have changed by now, but some games just ‘see’ the joystick a little differently than others. Your best option is to recalibrate when this is the case, and leave the joystick calibrated for the yoke game you use most often! Windows isn’t finding my joystick.. why? It’s probably because you have a bad connection going to one of your potentiometers. When Windows ‘looks’ for a joystick, it is looking for current running from the +5 V pin of the game port to BOTH the X and Y axis pins. If this isn’t happening on both pins, Windows will not acknowledge the presence of a joystick. Windows doesn’t care about the button connections when looking for joysticks, so keep this in mind. Windows may tell you that the joystick is connected and functioning properly without knowing that you missed a button wire. Are there any other yoke hacks out there I should check out? Yes! 1UP has put together an alternative method--take a look at: http://www.1uparcade.com/ His hack is USB compatible, as it is based on Microsoft’s Dual Strike controller. It is an excellent hack—I have tried it myself and it works like a charm. Which hack works better, Jude’s game port yoke hack or 1UP’s USB yoke hack? I have built and compared both hacks, and I can say that (on my machine) 1UP’s USB hack provides smoother control than the joystick port hack. My guess is the Dual Strike has better resolution on its analog to digital converters than the PC game port does. 1UP’s hack also has the added advantage of USB compatibility, and mouse functionality to boot! Still, the old joystick hack does have some advantages—it may end up being a little bit cheaper (depending on how much you pay for a Dual Strike), and will work well if you’re setting up a MAME rig based on a DOS platform or an older PC that doesn’t accommodate USB.